Signup for your free SANGKRIT.net account to startup. The new humankind is a smart phone user. He is dressed comfortably having a comfortable hair style. He doesn’t unnecessarily talk on phone but uses it for living better. What he may not necessarily has, is his domain. So let him be that comfortably developing his domain as his global property on the go. Helping him, in developing a new domain with complete internet infrastructure, online support and global exposure, is the way of hacktivism in 2017. The new humankind is not anonymous. He signs to transact. He doesn’t go out for occupying wall street as he buys stocks for that but he would certainly prefer occupying webspace. He knows that the real romance is in responsible parenting so the new humankind is never wasting time and attention in pleasing others like he doesn’t dress-up to show-off. He lives his real self very naturally. That is why he deliberately needs his way of connecting with his world and that should become his domain. It is now your business to prepare him like that. 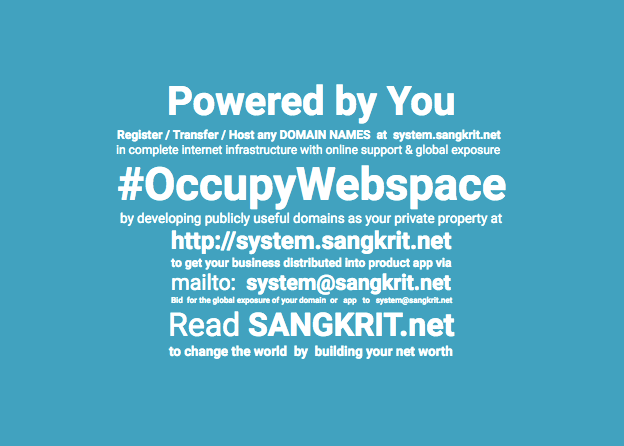 Signup for your free SANGKRIT.net account to startup as personal outlet of the globally distributed order of Sangkrit. The collaborative measure of Sangkrit lives like a humankind with his System Administrator for ruling his subjects and his Core Programmer for determining his objects. You should be selling the whole life-style of the new humankind. That is fashionably better way of transporting humanity into internet age. This could become your starting point that is actually going to change the world by becoming the biggest business on planet earth.